Take bread circles and press them into the muffin pan, set aside. Heat a large skillet on medium-high. Cook bacon on the skillet until partially cooked but still pliable, about 3 minutes. 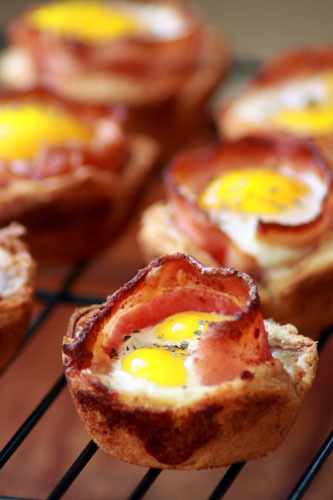 Shape bacon strips into the toast cups, fill with 1 Tbs of shredded cheese. Place in the oven for 5 minutes, allowing the bacon to toast just a little more. Remove from oven. Crack your egg and separate out most of the egg white. Drop eggs into the cups, sprinkle with salt & pepper to taste. Place back in the oven and cook until white begins to set, about another 8 – 10 minutes. The yolk should be creamy. Remove from oven when done and pop out using a spoon, serve warm.